I used to fantasize about swimming through a pool of cookie dough ice cream. Neither frozen nor liquid, but melted enough so that I could chomp my way through it, like Ms. PacMan. This image doesn’t get me going like it used to. I no longer pine for access to as much ice cream as I want. If you’ve followed my story so far, I’ll bet you can guess why. And if you can’t guess, read on. In the last couple of months, I’ve reached several milestones in my ever-improving relationship with food. Because of a little thing called “professionalism in the workplace,” I don’t get to brag about these on a daily basis to the people with whom I spend the most time, as it would cross boundaries if I gushed about this at the internship to dietitians who supervise me. So thank you for being my sounding board :). 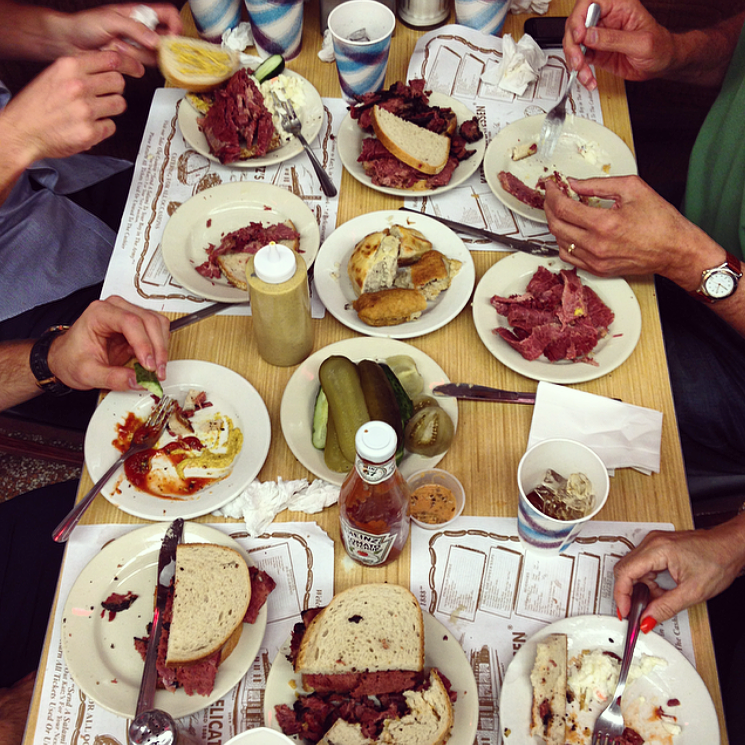 About a month ago, my parents and I went to Katz’s Delicatessen with my boyfriend and his brother. Despite the fact that each sandwich is big enough for two, in true Groman form, we ordered 5 sandwiches, plus 3 knishes, cole slaw, and a couple plates of pickles. The last time we went to Katz’s was May 2013, when my sister was in from LA. I had recently finished a juice cleanse and was about 2 sizes smaller than I am now. It’s very safe to say that I wasn’t allowing myself to eat things like Katz’s on a normal basis. So at that dinner, I was very excited to eat, eager to get it all in because I wouldn’t be “allowed” to eat food like that again any time soon. In addition to the sides, I ate at least a full sandwich that night. Milestone No. 1: on this recent trip, I only ate about half a sandwich (yes, plus sides, I’m human after all). How? I stopped when I was full. I STOPPED WHEN I WAS FULL! I didn’t feel that anxious sense of urgency to eat as much as possible, and I felt satisfied without feeling totally stuffed. Gosh, I’m not sure if I’m conveying how exciting this was for me. It was such a different experience from last year – without the anxiety and guilt surrounding eating – and I felt so proud, because it showed me how far I’ve come. Plus, my nutritionist said that stopping when full is a very “advanced” step, so I’m pretty sure I’ll get a gold star when I see her next. This past Thursday night, I went to CVS and decided to pick up a pack of Mega Stuf Oreos while I was there. On my way back up to my apartment in the elevator, I looked down at my shopping bags and saw the characteristic blue of the Oreo package peering through. There were two other people in the elevator with me, and I wondered if they saw it, envious that I had Oreos and they didn’t (what, not normal?). I also wondered if they were all, “Omg I can’t believe she can keep a box of cookies in her apartment without eating the whole thing at once.” And that’s when it hit me. I was like – Hold. Up. Am I the type of person that can keep a box of cookies in her apartment without eating the whole thing at once?! And I think I AM!!! 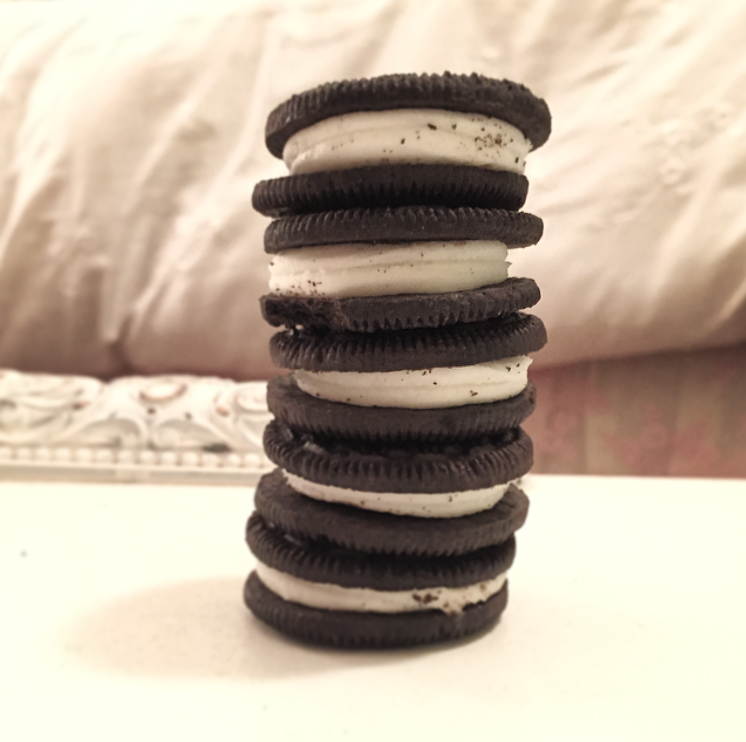 This was the second time this month that I’ve purchased a pack of Mega Stuf Oreos to keep at home (this has become my boyfriend’s favorite Oreo, so the first pack went rather quickly…), and I NEVER used to be able to keep multiples of any sweets in the house. But I purchased them the other night without feeling nervous, which is another major freakin’ milestone, and I’m so excited about it. There were some other things, too – I had to leave early from a late dinner earlier this fall, and I was able to leave before dessert arrived without feeling like I was totally missing out. At a breakfast buffet this past Sunday, not only did I not go crazy and eat everything in sight, but I didn’t even feel the need to. So, to address why I no longer secretly wish that Conrad will fill a swimming pool with cookie dough ice cream for my next birthday (or dream of bathing in a tub of Reese’s Pieces, or want to enter that Ben and Jerry’s contest where you eat a gallon of ice cream and like, win a T-shirt), it’s because I no longer tell myself I CAN’T eat those foods if I want to. Unlike last May, I don’t restrict desserts, pizzas, sandwiches, pasta. It’s not that I eat eat pizza and burgers all the time – it’s that I know I can have a slice every so often, or eat a burger if I’m really craving one. Because I don’t restrict foods anymore, my body no longer thinks it’s missing anything, which means that when I have access to large amounts of food at once (Katz’s, buffets, etc. ), my body doesn’t drive me to eat it all in one sitting. I can’t stress enough the power of letting foods like this back in your life. Because doing so takes the power away from those foods, and gives it back to you. So you have the power to stop when you’re satisfied, or to decide whether you want a cookie tonight or tomorrow. And, since you no longer feel the need to eat all the cookies at once, you also have the power to share – which will make those in your presence very happy :). This entry was tagged breakfast, diet, eating, exercise, food, foodie, holiday season, holidays, nutrition, vacation, weight, weight loss, weight management. Bookmark the permalink.